The fabled Bermuda Triangle. A strange triangulation between Florida, Bermuda, and Puerto Rico in which people have reported anomalous phenomena for centuries. Airplanes and ships have vanished while traversing the so-called Devil’s triangle and have never been found. Well, at least not most of them. There have been reports of strange lights and bizarre effects on navigational equipment when crafts enter the strange vortex on Earth. However, that isn’t the only anomalous region that we’ve found. Miles high above the Earth, another strange triangulation exists. 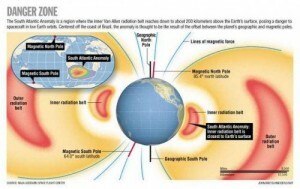 Known as the South Atlantic Anomaly (SAA), scientists and engineers have been fully aware of its effects on space travel. 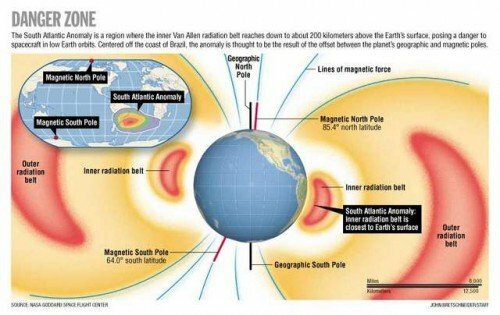 The SAA resides a few miles above the coast of Brazil and it is made up of some of the strongest solar radiation that is close to our planet. 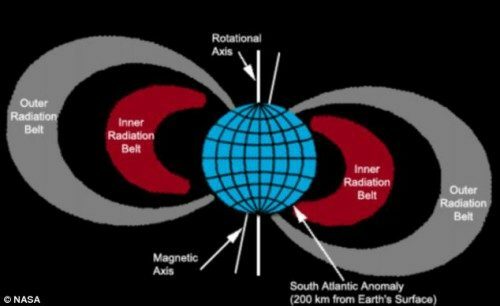 The radiation belt has been known to us since the early 1950s, but it isn’t until recently that European scientists released a map of the SAA. Some spacecraft, such as the Hubble Space Telescope, are even programmed to switch off their delicate instruments as they fly through the area to avoid damage. The International Space Station has also been given extra shielding to deal with this problem. Astronauts are also affected by this region, which is said to be the cause of peculiar ‘shooting stars’ (phosphenes) seen in the visual field of astronauts. The above image shows the area that the SAA covers above the Brazilian coast. The solar radiation is the strongest in this area and has caused navigational equipment and onboard computers to fail at times. There are also reports of strange light activity at that altitude. Exactly what is experienced when crossing the sky and waters that make up the Bermuda Triangle on Earth. It’s no surprise that the Earth’s magnetic fields play a big role in the disappearances of ships and airplanes throughout history. When ships sometimes sail across the Bermuda Triangle they’ve reported their equipment going haywire due to the strong magnetic fields that converge over that territory. The captains and crew members have also reported strange lights when cross the Triangle, giving birth to several extraterrestrial theories for decades. It’s now known that high levels of ionization and strong magnetic fields can create strange light activity in the skies or space for that matter. Science and research is explaining the paranormal one anomaly at a time.